Check your sethings in RS to make sure "report location " is on. You can be logged into SN and display other spotters and still not report your location if that setting is off. Yes, it’s on! Even the location settings in my phone itself. That’s what I meant in my post when I said “location is on” that was my “report location” swipe tab. Everything is as it should be! Report location is on, cell phone location is on for the app, logged into Spotter Network. I’ve tried with and without wifi, this is my second phone since having the app, occasionally it will show my location in the app as my dot and my name in the list at the top, it disappears about an hour later at most! I can see other people! I don’t know what’s going on with it! I’ve reinstalled the app a few times! Even with a pro subscription it did this! 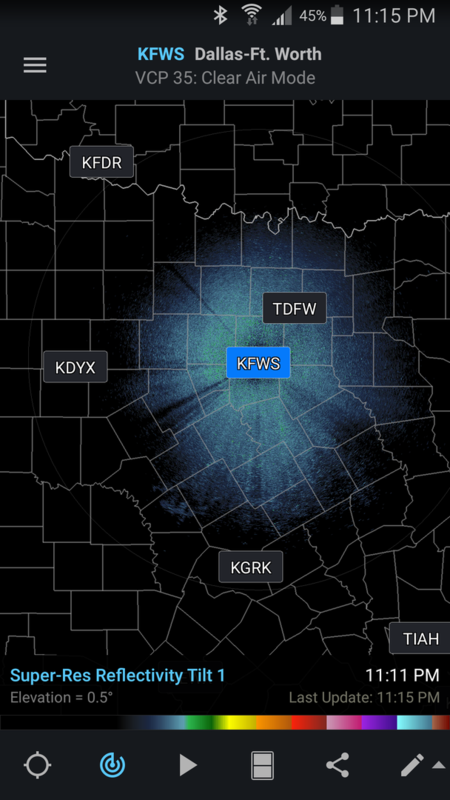 Hi Amanda, does RadarScope have the icon like in this post? You also mentioned mping in a previous comment, please know that mPING and SN have no relationship and are completely separate in the data. Having a pro subscription would have no impact on this working or not. No, usually it doesn’t. It comes on prior to the brief moments my location is being displayed. That would be the key then. It would be something with the app or with location services on your phone. Unfortunately we can't help with device-specific issues. Ok! I’m happy we found the problem!! Thanks anyway! I’ve been through two phones and several reinstallations, But with our investigation I’ve learned I can manually have my location temporarily displayed, so we’ve made progress! Silly question, do you have the select radar site (ie. K### is showing) on? On my android device when you have the select radar turned on, the location ring goes away. Turn the select radar off, and the location ring appears again. I don’t know what you mean, but there’s a button at the bottom that looks like an arrow, when I tap on it, it shows the location ring and a while later my dot appears. I have to do this every time I open the map. My phone settings allow the app to track my location and run in the background! It just never stays on for me! I will note, that on the RS version I now have on my Android device, turning on select radar no longer makes the location circle go away, however, if you have select radar on then turn on location, the select radar goes away. It also will never show other spotter locations when select radar is on.